The 2018 Tanglewood schedule features a season-long celebration of the centennial of the birth, in Lawrence, MA, of Leonard Bernstein, who became the protege of Serge Koussevitsky in 1940 as a member of the first class of what became the Tanglewood Music Center. Bernstein’s last performance was at Tanglewood in 1990, two months before his death. This program launches a multi-year survey at Tanglewood featuring Paul Lewis in piano works by Haydn, Beethoven, and Brahms. UndersScore Friday Concert – Patrons will hear comments about the program directly from an onstage BSO musician. Once again this summer, in collaboration with the Kripalu Center for Yoga & Health, Tanglewood is pleased to offer hour-long yoga classes taught by fully accredited Kripalu teachers from 10:15-11:15am on Saturday mornings (weather permitting). Located on the lawn near the Tanglewood Visitor Center, these weekly classes are available at no additional charge to Saturday-morning BSO Rehearsal ticket holders on August 4, 11, 18, and 25. Concert of varied works. Repertoire to be announced. 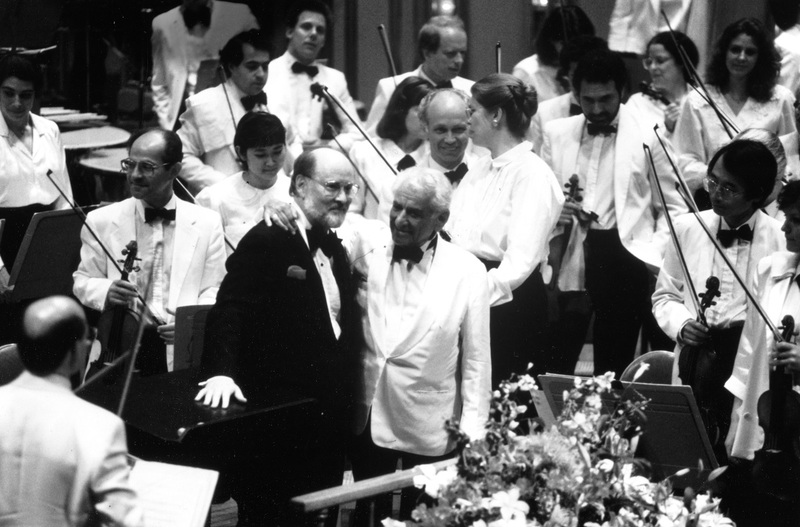 Leonard Bernstein and John Williams, Harvard Night at the Pops, June, 1989; courtesy BSO archives. From 1958 until 1972, Leonard Bernstein and the New York Philharmonic presented a landmark series of televised Young People’s Concerts™ which introduced classical music to millions of listeners. Inspired by Bernstein’s pioneering work as an educator, the BSO and Andris Nelsons offer a one-time-only hour-long program designed especially for young audiences and their families. Following in the great tradition of her father, Jamie Bernstein will be the evening’s host and presenter. John Williams’ Film Night has long been established as one of the Tanglewood calendar’s most consistently captivating evenings. Join Mr. Williams as he presents this year’s celebration of the music of Hollywood and beyond, featuring the Boston Pops and BSO Music Director Andris Nelsons. UnderScore Friday Concert – Patrons will hear comments about the program directly from an onstage BSO musician. When Leonard Bernstein and Jerome Robbins created the hit ballet Fancy Free in 1944, each was just twenty-five years old. As Bernstein’s first ballet score and Robbins’ first full-scale choreographic effort, it catapulted both men to stardom. In what would become his signature style, Robbins combined classical choreography with jazz and popular dance moves. Just months after Fancy Free was premiered at the old Metropolitan Opera House, its scenario had become the basis for Bernstein and Robbins’ hit Broadway musical On the Town (being performed July 7). Fancy Free will be presented here in collaboration with Boston Ballet, using Robbins’ original choreography. Reflecting the season-long theme, The Bernstein Centennial Celebration at Tanglewood will spotlight Bernstein’s wide-ranging talents as a composer, his many gifts as a great interpreter and champion of other composers, and his role as an inspirer of a new generation of musicians and music lovers across the country and around the globe. The gala concert will feature a kaleidoscopic array of artists and ensembles from the worlds of classical music, film, and Broadway. The entire first half of the program is dedicated to selections from such brilliant Bernstein works as Candide, West Side Story, Mass, and Serenade. Music from the classical canon very dear to Bernstein’s heart-selections from Mahler’s Des Knaben Wunderhorn and music by Copland-plus a new work by John Williams, makes up a good portion of the program’s second half; the finale of Mahler’s Resurrection Symphony brings the program to a dramatic close. *Joined by members of the New York Philharmonic, Vienna Philharmonic Orchestra, Israel Philharmonic Orchestra, Tanglewood Music Center Orchestra, Pacific Music Festival, and Schleswig-Holstein Music Festival. One Day University, the acclaimed lifelong learning series, returns to Tanglewood for the eighth year! Join these award-winning professors from three renowned schools, each presenting their best lecture in Ozawa Hall. Then join Christoph Eschenbach and the BSO for the 2018 season finale performance of Beethoven’s Ninth Symphony. Tickets for the 2018 Tanglewood season, $12-$160, are available through Tanglewood’s website, www.tanglewood.org, SymphonyCharge at 888-266-1200, and at the Symphony Hall Box Office at 301 Massachusetts Avenue, Boston MA. Download the 2018 Tanglewood season brochure.